Join Washington Revels in celebrating the world through children’s stories! This Spring, we’ll discover a Haitian folk tale of how the waves were created, hear about the prince who thought he was a rooster, find out about Makhosi and the Magic Horns, learn the “Price of Steam,” and take a magical journey with a white mare! 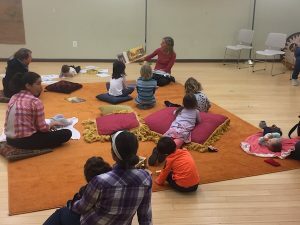 Revels World Story Time is geared toward the 3-7 year old age, but all are welcome! Have a story you’d like to hear? Email Jo Rasi at jrasi@revelsdc.org for recommendations or any questions you might have.